This book paints a portrait of adolescent psychology in 4 major regions: Africa/the Middle East, Asia, the Americas, and Europe. 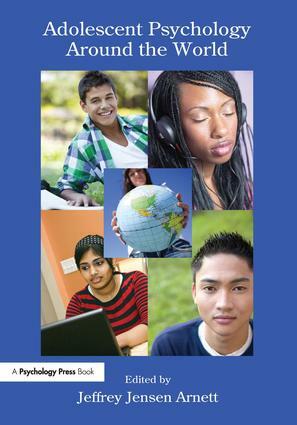 Featuring 24 revised and updated chapters from the International Encyclopedia of Adolescence (2007), readers are introduced to the way the majority of the world’s adolescents actually live. Most contributors are indigenous to the country they review. As a whole the book paints an engaging panorama of adolescent life around the world, broadening students’ cultural perspective. All chapters follow the same template to make it easier to compare topics across countries: Background (including demographics, ethnic diversity, and political system), Period of Adolescence, Beliefs, Gender, the Self, Family Relationships, Friends and Peers/Youth Culture, Love and Sexuality, Health Risk Behavior, Education, Work, Media, Politics and Military, and Unique Issues. Each chapter contains a map and photos and a list of references and suggested readings. The introductory chapter explains why the countries were selected and introduces the book’s common themes. The section on Africa and the Middle East introduces students to teen life in Cameroon, one of the few places left where adolescents go through formal puberty rituals. In addition, readers learn about adolescent life in Ethiopia, Israel, Morocco, Nigeria, and Sudan. Next we travel to Asia -- China, India, Indonesia, and the Philippines. Here readers see how economic growth in India and China is creating opportunities for young people. In The Americas, readers are introduced to life in Argentina, Canada, Chile, Mexico, Peru, and the United States. The book concludes with adolescent life in Europe including the Czech Republic, France, Germany, Italy, the Netherlands, Russia, Sweden, and the UK. Intended for courses in adolescent psychology, lifespan development, and/or cultural (cross-cultural) psychology taught in departments of psychology, human development and family studies, sociology, and education, this book will also appeal to researchers and clinicians who study or work with adolescents. J. Jensen Arnett, Introduction. Part 1. Africa and the Middle East. T. Mungah Shalo Tchombe, J. Lo-oh, Cameroon. G. Tadele, W. Kifle, Ethiopia. R. Seginer, S. Shoyer, Israel. D. A. Davis, S. Shaefer Davis, Morocco. P. N. Ibeagha, Nigeria. A. Dafalla Ahmed, Sudan. Part 2. Asia. X. Chen, L. Chang, China. N. Chaudhary, N. Sharma, India. H. Lestari Mikarsa, Indonesia. Part 3. The Americas. A. Facio, S. Resett, Argentina. H. A. Sears, Canada. M. Loreto Martinez, P. Cumsille, Chile. R. Mejia-Arauz, R. Sheets, M. Villasenor, Mexico. J. Pinzas, Peru. A. DeDios, United States. Part 4. Europe. P. Macek, L. Lacinova, E. Polaskova, Czech Republic. L. Lannegrand-Willems, C. Sabatier, C. Brisset, France. E. Dreher, U. Sirsch, S. Strobl, Germany. S. Bonino, E. Cattelino, Italy. W. Meeus, Netherlands. W. Podolskij, Russia. K. Trost, Sweden. J. Coleman, D. Roker, United Kingdom. Jeffrey Jensen Arnett is a Research Professor in the Department of Psychology at Clark University in Worcester, Massachusetts, USA. During 2005 he was a Fulbright Scholar at the University of Copenhagen, Denmark. Dr. Arnett is the editor of the Journal of Adolescent Research and author of the book Emerging Adulthood: The Winding Road from the Late Teens Through the Twenties (2004). He is also author of one of the most widely-used textbooks on adolescent development, Adolescence and Emerging Adulthood: A Cultural Approach, 4th Edition (2009). He has appeared on television and frequently in print media, and was featured in a cover story in the New York Times Sunday magazine in August, 2010.